Told in terms of “west” and “Africa” — the four zoo animals and the lemurs, respectively — the parallels between this story and the stereotypical African narrative are uncanny. The Westerners become stranded on African land and must learn to adapt in the harsh environment. They find mostly jungles, but finally stumble across a strange group of natives. They do not understand the natives’ foreign way of life and one of them desperately attempts to escape this strange land. The natives see them as “giants,” powerful, God-like entities capable of helping them. The native people, who live in constant fear of an aggressive neighboring tribe, recruit the help of the superior Westerners to fight their tribal war. The natives ultimately benefit and become dependent on the Westerners. The Westerners are now heroes, revered for saving the native people from their barbaric survival. They finally escape the “crazies,” but end up crash-landing somewhere in an African reservation. There, they meet animals similar to them, but that have never been exposed to Western culture. The natives and westerners see each other’s cultures as somewhat strange and have difficulty accepting each other’s practices. The only humans are New York tourists who must survive the harsh African landscape by resorting to barbaric and primitive ways of life. After encountering many stereotypically African groups (the lion tribe, superstitious giraffes, etc. ), the Westerners succeed, again, in saving the natives from a drought. They are revered by the natives and finally accepted into the culture. 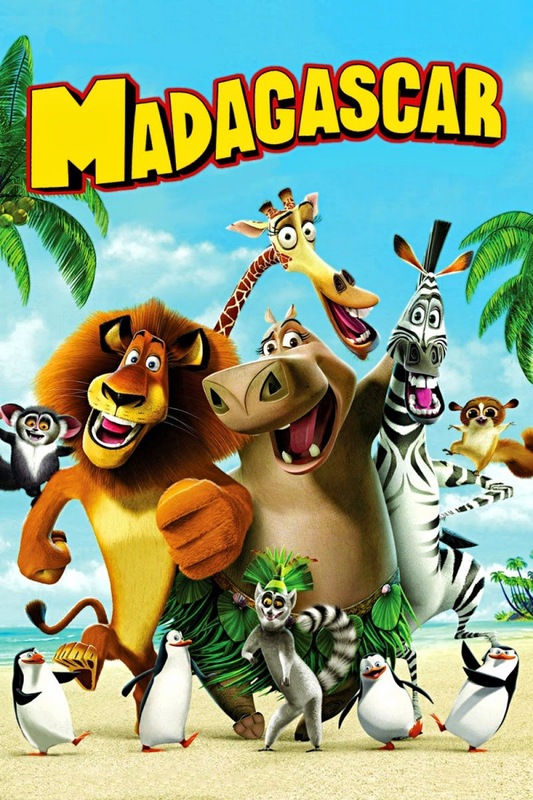 Some of the major themes brought up in the Madagascar series include the “White Man’s Burden,” the Dark Continent, and the idea that Africa is one place filled with primitive natives and suffering. Throughout the Madagascar series, there are never any native African people. In the first film, the only people in the entire movie are in New York. When the lemurs greet the zoo animals, their leader, King Julian, informs them that the only humans on the island are dead ones. There was a plane crash and the only remnants of human life is a rotten skeleton hanging from a tree. This, whether or not it be for comic relief, perpetuates the Dark Africa narrative. It suggests, at least in a child’s mind, that Africa is a wild land filled with death and barbarism. In Madagascar: Escape 2 Africa, there is a slightly different situation, but it also has a similar effect. When the New York zoo animals crash on mainland Africa, the audience is never informed where they landed. While this is a subtle exclusion of relatively unnecessary information, to a young child, this image of Africa becomes their only perception of Africa. As a result, Madagascar’s seemingly harmless portrayals of Africa can potentially have a large impact on the innocent adolescent. They crash land on an animal reservation only used for safari expeditions. Furthermore, the only person presumed to be native to Africa has a stereotypical African accent and is in charge of leading the tour group. This image of Africa could potentially be subconsciously generalized to the entire continent. As a child, it is easy to make a sweeping assumption that Africa as a whole is only used for exotic safari expeditions — not a place with culture or a place to live. The lemurs in the Madagascar series, especially those from the first movie, are analogous to the primitive native because of their resemblance to the stereotypical tribal system in Africa. Not only do they revere and honor the western zoo animals, they also become dependent on them for survival — the major theme in the “White Man’s Burden” narrative. The lemurs use a traditional, stereotypical tribal structure with an all-powerful king on top and the rest of the people on one level below him. The western zoo animals see the lemurs as crazy and foreign. They become a source of comic relief throughout the series for their eccentricity. They are depicted as weak and Alex even refers to them as “bozos” on one occasion. King Julian, the leader of the lemurs, brings to light many African stereotypes. Although they are subtle and not intended to ridicule Africa, they subconsciously perpetuate these stereotypes. King Julian believes himself to be in touch with the Gods. In Madagascar: Escape 2 Africa, he states that he can speak with the Gods and proposes a sacrificial plan to convince the “water gods” to restore water to the watering hole. Although it is simply meant to be humorous, it reinforces the negative stereotypes on polytheistic religions. His beliefs are presented as ridiculous, things to be laughed at; however, his beliefs reflect the western conception that Africans all practice polytheistic religions with deities for various elements. Many African cultures do indeed celebrate Gods that harness the power of nature. In this way, Madagascar is specifically poking fun at what is commonly seen as African religion. This has a huge effect on western audiences, especially kids, who primarily practice monotheism. It will subconsciously reinforce, their minds, that monotheistic religions are more advanced than polytheistic, African religions. One of the most intriguing and offensive parallels in the Madagascar series is the depiction of monkeys. There are two major character groups: the two monkeys from the New York zoo and the remaining hundreds of monkeys who live on the African reservation. If incorporated into the West versus Africa narrative, the monkeys are clearly the natives. The monkeys are generally illiterate, used for cheap labor, and come off as uneducated, uncivilized, and strange. They speak in an incoherent screech, much different from the fluid English of most of the other animals, and look up to the “Westernized” New York zoo monkeys for leadership. This power dynamic between the Western animals, the Western monkeys, and the African monkeys is analogous to the social hierarchy between the Western world, the educated African elite, and the native Africans. When the two monkeys are in New York, they are depicted as almost barbaric — eating food out of the trash can, drinking leftover soda, etc. They are within the Western culture, but aren’t exactly a part of it. When the two monkeys land on the African reservation, they quickly take up the positions of power in the monkey society.They are depicted as more intelligent than their screeching doppelgangers, and even begin to dress as European aristocrats. They don a bow tie, tuxedo, top hat, and even a monocle. It is clear that they do not belong among their own kind anymore. This power dynamic is very similar to the colonial-educated African elites. They did not fit into either society and made up a very small portion of the population. The social hierarchy depicted in Madagascar places the Westernized monkeys below “true westerners” but above the natives. This could have a subconscious effect on an unweary child causing them to accept and adopt this world view.